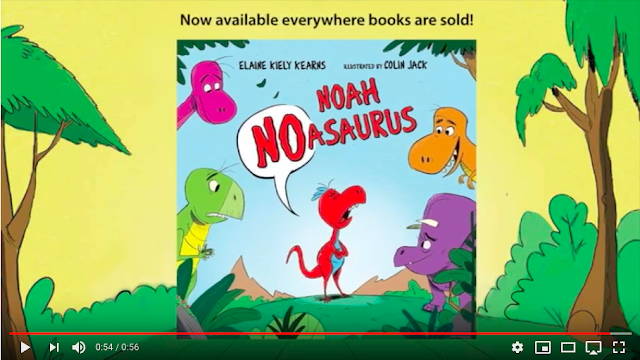 My critique and Kidlit411 partner Elaine Kiely Kearns's picture book, NOAH NOASAURUS, illustrated by Colin Jack (Albert Whitman) debuts on April 1. As part of the marketing effort, I made her book trailer using software that comes pre-installed on any Mac. 1. Write a script. Elaine wrote the script for the trailer after studying a bunch of other trailers and figuring out what works. She sent me the text and suggested accompanying images. Her script was so awesome that I didn't change a thing. 2. Compile a rough trailer in iMovie. Import still images from the book (get permission from your publisher) and play around with the text/font options in iMovie to lay out your basic video. Aim to keep each image up for 3.5 to 4 seconds and the overall trailer to run under 1 minute. Decide which images you want to animate (you'll do that in Keynote). For all the rest, play with the iMovie camera panning options like the Ken Burns effect to make the still images feel dynamic. Note: You don't need to have animated elements. You could make your whole trailer in iMovie. In Photoshop, separate the foreground characters from the background, or ask your illustrator to provide them in separate files. The characters should be saved with a transparent background in a png file. Fill in the background in the areas where you've cut out the character. In Keynote, create a new slideshow. On a blank slide, insert the background image and the character image you want to animate. Click on the character image and select "Animate." Play with the different ways the element can move (fly into the screen, jiggle, bounce, move, etc.) and play with the timing. When you are happy, export the file as a movie. It should be a clip about 4-7 seconds long. Import the movie clip into iMovie, replacing the still image with the animated sequence. Trim the movie clip to about 4 seconds (trim it in iMovie or play with the timing in Keynote before exporting it). Repeat for all animated sequences. I learned how to make a trailer when my book, A MORNING WITH GRANDPA, illustrated by Christina Forshay (Lee & Low Books 2016) came out. Let me know if you have any questions. If you're handy with Photoshop, iMovie, and Keynote, it's gratifying to make your own book trailer. Book Depository (free worldwide shipping)! Great job, Sylvia—what a fun and compelling trailer! And big CONGRATS to Elaine on her publication! Thank you so much for sharing this! I'm saving this so I can try to make one for myself when the time comes! <3 Well done!! Thanks for sharing! I’ve always wondered how it’s done. It turned out wonderfully! Thank you Sylvia for these great tips. is Keynote on iMac's? I can't seem to find it. I have an iMac and have Keynote. Did you look under Applications in the Finder? Wonderful job! I'll save this for my next book. wow! Great info. I have a PC, so no imovie...But I've heard it's a great program. Thanks!